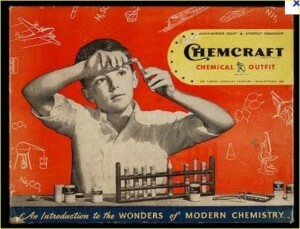 When I was a kid, I had a chemistry set. My parents thought it would be educational, and for a 10-11 year old kid, I suppose it was. But after I’d made all the crystals and stinky stuff, I yearned for more. That was about the time the kid across the street introduced me to carbide. This is a little rock with an unusual property: when you spit on it, it bubbles like crazy (kinda like spitting on an Alka-Seltzer). And if you hold a match to the bubbles, they ignite. This got me very excited. But when I went home to my chemistry set, carbide was not one of my chemicals. Reading the manual more closely, they explained that my set only included “safe chemicals” that do not explode. That is when I knew I had to go outside the system. After making discreet inquiries about this carbide stuff, I found a kid who had some. He was willing to trade me a small supply for 4 steelies, 8 puries, and 10 of my best cateyes (marbles). It was a high price, but I was determined. When I got them back to the lab (my chemistry set in the basement), I began experimenting with my new purchase. I found if I contained the gas and let it build up a bit, it ignited with a very satisfying “boom”. To do this, I used very high-tech equipment consisting of a tin can with a hole in the side that I made with a hammer and nail. My experiments suggested the best nail hole should be near the opening, about 1/2 inch in from the rim. As you know, you can’t really count on results you find in the lab. If you are going to do proper testing, you have to field test it. Fortunately, I had a large driveway that worked well. My required components for the test included: a wood board (launch pad), a tin can with a hole in the side, a carbide pellet, matches, and spit. I carefully put the pellet on the pad, spit on it (being careful to get generous amount of spit so as to fully cover the pellet). Then, place the can over the spit-pellet. Wait until the can fills with pellet gas. Then hold a lit match next to the little hole in the side of the can. This produces a really great little explosion, which blows the can straight upward for several feet. Several repeated trials convinced me I was on to something here. Unfortunately, my supplies were running low. I could have gone at this point to talk to my parents, but I hadn’t really talked with them about exploding things. And, after all, the chemistry set manual had proudly proclaimed there were no exploding things inside, which suggested most grownups would not approve of exploding things. So at this point, I was not willing to expose my plans to such risk of ruin. Fortunately, I was by far the best marble player at Lincoln School. Only Fred Herring could sometimes beat me, but not often. So, armed with a few more marbles, I went out to increase my wealth. And I knew all the tricks. As soon as my challenge was accepted, I would immediately say, “Triple Kings! Last all times!”, which guaranteed me the coveted right to go last for the duration of that game. Lots of kids, knowing my reputation, wanted to play for “Funs”, but I didn’t give in. It was “For Keeps” or nothing. 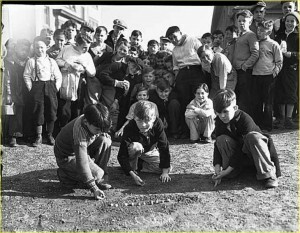 And, of course, we all agreed that “Trades” were allowed because if you lost the game, you certainly didn’t want to lose your lucky marble, so you were allowed give up a similar marble of like quality. And with every kid who would agree, we would put an extra marble or two in the pot to increase the stakes. In four more days, I had what I needed to go back to my supplier. He was happy to see me. He had even laid in a new supply in anticipation of my return. A few more days blowing tin cans into the sky led me to some disappointment. The amount of satisfaction you get from popping a tin can up in the air has a diminishing rate of return. After 30-40 times, the launches seem to blur together. I recruited Keith, Larry, and Jeff into the launch team. And it was fun to share the experience. 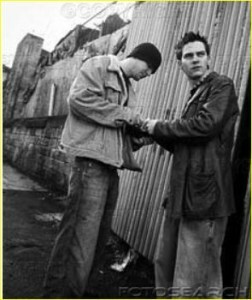 But, eventually, I knew I needed more than just blowing a tin can into the air. I knew I needed something that could go higher and faster. I needed more power. I needed to have my own rocket if I was ever going to achieve greatness. Nothing else could reach the heights to which I aspired. Fortunately, my wait was not a long one.